As Christians we sometimes fall into one of two traps concerning our future rewards. 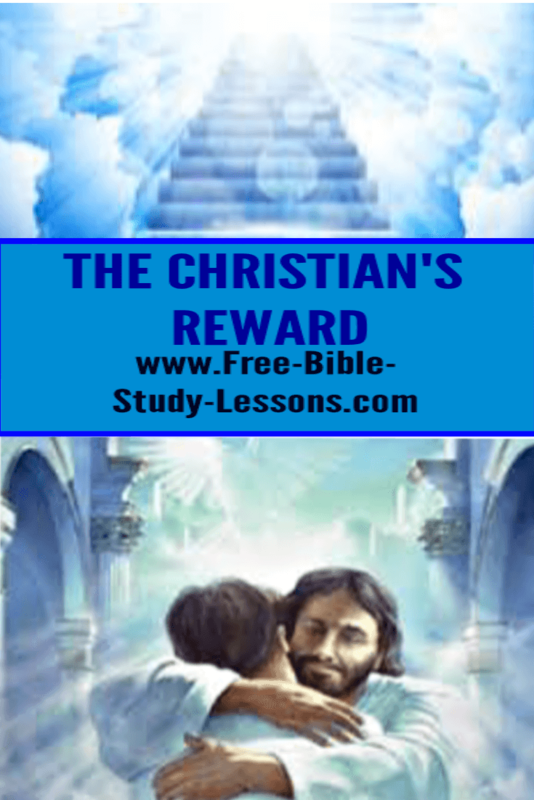 Some Christians become obsessed with the idea of rewards and heaven. As the saying goes: They become so heavenly-minded that they are no earthly good. A false eschatology, that has arisen in the last 100 years or so, has derailed a lot of Christians in this area. One of the reasons the world is in the shape it is today is that many Christians have withdrawn from their responsibilities in the world. This belief that the world is going to Hell and they are going to be raptured out of all their troubles to enjoy mansions in heaven has ruined many lives and perhaps nations. The opposite error that some Christians have fallen into is to disregard all future reward as mercenary. They believe that Christians should have no other motivation than love for God and people. To actually work for the Lord with the hope of a reward seems to them to selfish, immature and beneath their dignity. Yet these same people expect to get paid for the work they do for earthly employers. How Does The Bible View Working For A Reward? The first thing to make extremely clear, as we have in our Master Life course, is that we do not work to earn our salvation or maintain our relationship with God. It is by faith , through grace, not of works… [Eph. 2:8-9]. However, we were also created in Christ Jesus to do prearranged good works [Eph. 2:10]. God is not going to be outdone by earthly employers who pay for work rendered. God is no man’s debtor. As Paul approached the end of his life, what did he look forward to? For his faithful service, he knew he would receive a reward. He was not embarrassed about it. I am not saying it was the primary motivation for his life. He lived to please God and accomplish his mission, as we all should. However, he did not shy away from the reward he had earned in false humility or a rejection of the grace of God in providing it. In fact, Paul used his knowledge of future reward to encourage himself and others when he went through tough times. We all face hard and discouraging times. Knowing that God has a generous “pay check” at the end of our work day here on earth can be an encouragement. It can help us stay on track and make sacrifices that seem to have no personal benefit. It can be a comfort to us when we see a young Christian’s life cut short because we know God has something better for them on the other side. One of the ways Paul encouraged Christians to think of life was as a race, with a prize that was to be won. What is our reward going to be? The Bible does not give us detailed specifics. I think that is because in our present state we would be unable to comprehend the greatness and true condition of our future reality. Imagine trying to explain to a child in the womb the wonders of the world he or she is about to be born into. Impossible. They have no frame of reference for blue skies, gentle breezes, loving embraces, good food or just about anything in world. Likewise, the world to come is so much greater than our ability to comprehend. Do we get rewards now? We can have a growing relationship with Jesus, which is the greatest possible reward. As far as physical rewards the answer is maybe. God has a generous heart. He wants to bless His children in every way. For some that means earthly blessings, for others not so much. We can see in the Hebrews chapter 11 Faith Chapter that they all had faith, but some were delivered and some were not. Reward after death for the faithful Christian is guaranteed. Reward on earth sometimes, sometimes not depending on the will and purpose of God in individual situations. On this earth, we are in a war. War requires sacrifices to reach the final objective.